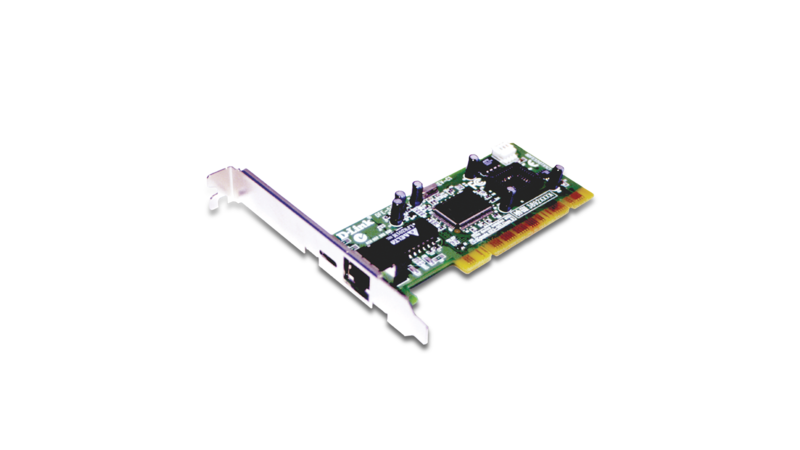 The D-Link DFE-550TX is a manageable 10/100MB Dual Speed Ethernet PCI Network Interface Card with Wake-On-LAN (WOL). The DFE-550TX provides an industry standard interface for a desktop computer to access an Ethernet, Fast Ethernet, or Dual Speed Network. The DFE-550TX is fully compliant with IEEE802.3 10Base-T, IEEE 802.3u 100Base-T specifications as well as IEEE 802.3x Flow Control. The MAC controller for the DFE-550TX is D-Link's DL10050B chipset which implements several advanced features. Aside from the ACPI/WOL (Advanced Configuration Power Management Interface) feature, the DFE-550TX supports IP Multicast packet filtering, PXE (PreBoot execution Environment) Boot ROM, IEEE 802.1p, IEEE 802.1Q, and DMI (Desktop Management Interface). For standard network functions, the DFE-550TX utilizes plug-and-play feature for easy installation. The DFE-550TX's single RJ-45 connector automatically negotiates to the highest speed at half or full duplex using industry standard NWay auto-negotiation. With the PCI 32-bit data bus, the DFE-550TX delivers high throughput without using on board memory. Integrated 2Kbyte RxFIFO and 2Kbyte TxFIFO cache buffers synchronize transmissions and buffer data to help prevent packet loss. The DFE-550TX's compliance to PCI 2.2 Bus Specification along with its integrated FIFO buffers lower overall CPU utilization. Furthermore, the DFE-550TX uses chip-level address filtering when implementing IP Multicasting. As multicast data such as stock quotes, video and audio conferencing, and database replication becomes more prevalent in the network, IP multicasting will help alleviate the need to maintain parallel networks for voice, video, and data. By examining multicast packets, the DFE-550TX conserves CPU utilization while accepting only the packets intended for the host's Multicast group. The DFE-550TX's compliance to IEEE 802.1p Priority Tagging ensures that time-critical data arrives on time by using tagging to define the data packet's priority. Whereas, compliance to IEEE 802.1Q improve network performance and security by limiting broadcast and unicast (node to node) traffic within a single VLAN. The value-added management features offered by DMI allow remote troubleshooting and higher quality management of computers equipped with the DFE-550TX. The DFE-550TX ships complete with a WOL cable and drivers for the most popular operating systems including Windows, Netware, and Linux. As with most D-Link networking products, it comes with a lifetime warranty and free support. This product was phased out on: 1.11.2003.